Trial Support and Local Counsel - Shannin Law Firm, P.A. Don’t wait until a verdict to bring in a board certified appellate attorney to assist as co-counsel. From the earliest stages of litigation through to the post-verdict motions, the Shannin Law Firm, one of the top appellate law firms, can provide trials support both for the benefit of our clients and for the clients of our colleagues who retain the Shannin Law Firm to assist them. Our trial support services can include responding to motions to dismiss, motions for summary judgment, pre-trial motions, and evidentiary issues as well as all matters involving appellate law. 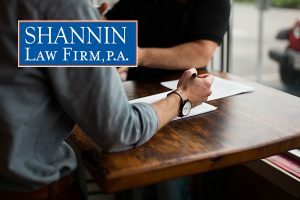 The preservation of error at trial or the presentation of post-verdict motions can be paramount to the ultimate success of any case and having a board certified appellate attorney ready and available to assist at trial is a key advantage that the Shannin Law Firm can provide to clients and co-counsel. Call one of the best appellate law firms, the Shannin Law Firm to discuss having our firm support yours for challenging cases or to serve as local counsel for your Florida state or federal litigation.